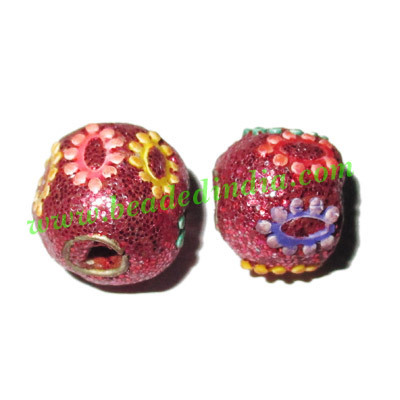 Fine quality kashmiri beads, also called bollywood beads or lakh beads, size 13mm, weight approx 1.59 grams. Pack of 100 pcs. Leather Cords 6.0mm (six mm) round, regular color - bottle green. Leather Cords 6.0mm (six mm) round, regular color - light tan brown. Sterling Silver .925 Headpin, size: 2 inch (51 mm), head size : 3mm, weight: 0.22 grams. half sleeve long khadi yoga kurta, size : chest 48 x height 34 inches (large). Leather Cords 2.0mm flat, regular color - carbon grey. Silver Plated Fancy Beads, size: 12x12mm, weight: 3.06 grams.